Background/objective: Previous studies have already reported an independent effect of light-load eccentric exercise (10% eccentric exercise contraction [EEC]) and low-level laser therapy (LLLT) as a protective measure against more strenuous eccentric exercise. However, the difference between these two interventions is largely unknown. Therefore, the present study aimed to compare the preconditioning effect of 10% EEC vs. LLLT on subjective, physiological, and biochemical markers of muscle damage in elbow flexors in collegiate men. Methods: All 36 enrolled subjects were randomly assigned to either 10% EEC or LLLT group. Subjects in 10% EEC group performed 30 repetitions of an eccentric exercise with 10% maximal voluntary contraction strength 2 days prior to maximal eccentric exercise bout, whereas subjects in LLLT group were given LLLT. All the indirect markers of muscle damage were measured pre-exercise and at 24, 48, and 72 hours after the exercise-induced muscle damage protocol. Results: The muscle soreness was reduced in both groups (p = 0.024); however, soreness was attenuated more in LLLT group at 48 hours (33.5 vs. 42.7, p = 0.004). There was no significant difference between the effect of 10% EEC and LLLT groups on other markers of muscle damage like a maximum voluntary isometric contraction (p = 0.47), range of motion (p = 0.16), upper arm circumference (p = 0.70), creatine kinase (p = 0.42), and lactate dehydrogenase (p = 0.08). Within-group analysis showed both interventions provided similar protection over time. Conclusion: This study indicated that light-load eccentric exercise confers similar protective effect against subsequent maximal eccentric exercise as LLLT. Both the treatments could be used reciprocally based on the patient preference, costs, and feasibility of the equipment. Several reviews explained that nutritional support and pharmacological therapy are often used as the preventive and therapeutic modalities related to muscle damage.8,9 It has been observed that in subsequent bouts, changes in the markers of muscle damage are smaller and muscle recovery is faster than in the initial bout.2 Lavender and Nosaka4 reported low-intensity eccentric exercise (10% maximal voluntary contraction [MVC]) can also protect against muscle damage following the subsequent bout (40% MVC), which was performed 2 days later without any changes in muscle damage. In addition, they further reported that low-intensity EEC provides protection against not only submaximal exercise but also maximal eccentric exercise (100% MVC). Another study by Chen et al10 reported that performing two maximal voluntary isometric contractions 2 or 4 days before maximum eccentric exercise attenuates the muscle damage. Chen et al11 reported that 10% EEC confers attenuation or protection against the symptoms of muscle damage when it is performed 7 days prior to maximal eccentric contraction (Max-EEC). The underlying mechanisms of action of light-load eccentric exercise according to the parameter used include neural adaptation, mechanical adaptation, and cellular adaptation. Although since 1960 the therapeutic effect of low-level laser therapy (LLLT) has been the focus of research, Baroni et al12 in a human study observed that prior to delayed-onset muscle soreness (DOMS) protocol, the application of laser therapy causes a reduction in muscle damage and improves muscle function. Some studies in animals also showed effectiveness of laser therapy.13–15 These promising results may be due to the anti-inflammatory function of phototherapy16 to decrease discharge of reactive oxygen species,17 thereby both increasing the antioxidant capacity18 and improving mitochondrial function19 of the muscle. Protective effect of LLLT on muscle damage has recently been studied.20 Moreover, its usability may be limited by cost and availability constraints of the equipment as well as minimal technical expertise required for application when compared to readily accessible light-load eccentric exercise. Therefore, if found to be equally effective, 10% EEC can be used as an alternative to LLLT. The present study aimed to compare the protective effect of light-load eccentric exercise (10% EEC) vs. LLLT (808 nm) in the prevention of muscle damage by assessing physiological, biochemical, and subjective markers of muscle damage in collegiate men. Thirty-six collegiate men, aged 19–26 years, from Jamia Millia Islamia, New Delhi, India, were recruited. Participants who were currently taking medication, had an injury to their upper extremities, or were involved in heavy physical activity were excluded. Participants were requested to abstain from competition and physical activity, and avoid nutritional supplements during the period of the experiment. Ethical approval was granted by the Institutional Ethics Committee, Jamia Millia Islamia, New Delhi, India (proposal no: 17/9/21/JMI/ IEC/2015), and the subjects who consented to participate signed written informed consent in accordance with the Declaration of Helsinki. This is a comparative group study, prospectively designed with a random allocation of participants into two experimental groups: the 10% EEC group (n = 16; 22.9 ± 2.24 years, 166.3 ± 8.64 cm, 65.4 ± 8.56 kg, 23.6 ± 1.64 kg/m2) and the LLLT group (n = 20; 21.8 ± 2.33 years, 167.2 ± 4.68 cm, 64.3 ± 5.05 kg, 23.0 ± 1.7 kg/m2). The low-level laser was administered by a therapist, while the eccentric exercises were performed by volunteers under the supervision of a therapist. To ensure that their eyes were protected, both the therapist and volunteers in LLLT group used dark laser goggles. Experimental procedures were performed in the university laboratory. MVC, ROM, upper arm circumference, soreness, and serum CK and LDH levels were measured at baseline in both the groups. Participants in the 10% EEC group performed eccentric contraction of the elbow flexors (nondominant arm) with low intensity (10% MVC strength) at the elbow joint angle of 90°, 2 days before the Max-EEC bout. Subjects in the LLLT group were administered low-level laser (808 nm and 1 J per point of application, frequency 2000 Hz, at a power of 100 mW) to the muscle belly of biceps brachii by the contact method at four equidistant points immediately before the maximal eccentric bout. All the 36 enrolled subjects in both the groups performed Max-EEC of the elbow flexors (nondominant arm) with the dumbbell set at maximum voluntary isometric contraction at 90° elbow flexion. Subjects were encouraged verbally to complete the sets and were requested to perform 30 repetitions or until they felt exhausted. Subjects were not obligated (i.e., required) to complete full sets of the exercise. The criterion measures were taken at 24–72 hours after the Max-EEC bout. The nondominant arm was used for the measurement of all the clinical data, while the dominant arm was used for collecting blood samples. Data were evaluated by the Shapiro–Wilk test for normality. Soreness, MVC, and LDH values did not demonstrate normal distributions, and therefore, were log-transformed for further analysis. The demographic and baseline data were compared between 10% EEC and LLLT groups by an independent t-test. Sixteen participants in the 10% EEC group (n = 16) and LLLT group (n = 20) were assessed during the experiment. To test for the difference between the groups and across the four assessments, a 2 × 4 split plot analysis of variance (ANOVA) with the group (10% EEC and LLLT), time (pre and 24, 48, and 72 hours), and interaction effect (group × time) was applied. Assumptions of sphericity were tested using Mauchly’s test, and any violations were corrected using the Greenhouse–Geisser correction factor. When the main effect of time in split plot ANOVA showed a significant difference, a post hoc analysis using the Bonferroni test was employed to indicate a significant difference at different time points. 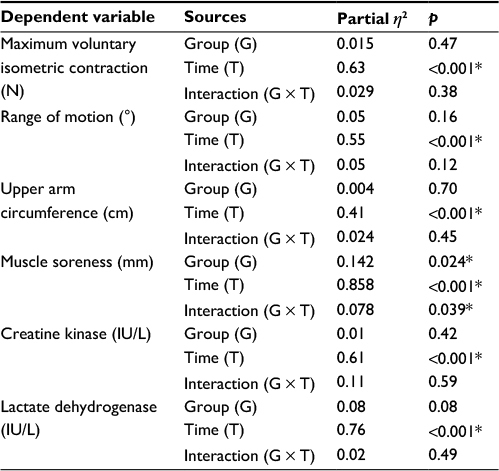 A repeated measure ANOVA was used to assess changes in MVC, ROM, upper arm circumference, soreness on palpation, and CK and LDH activity within the group from pre-exercise to 24, 48, and 72 hours postexercise. When the main effect of the group showed a significant difference by split plot ANOVA, to locate the difference in the group at a time point, independent t-test was applied. Data were presented as mean (SD). The significance level was set at p < 0.05. At baseline, the demographic characteristics between the groups in terms of age, weight, height, and body mass index were statistically insignificant. Similarly, MVC, upper arm circumference, CK, and LDH scores were statistically insignificant between the groups (p > 0.05; Table 1). Only muscle soreness on palpation had a significant main effect (p = 0.024). To locate the between-group difference at different time points, independent t-test was performed, which showed significant difference at 48 hours, whereas no significant difference was found at other time points. There was an insignificant difference between groups and groups × time; however, a significant difference was noted at pre-exercise and at 24, 48, and 72 hours in the entire criterion measures (Table 2; Figures 1 and 2). The mean and SD of all the variables at different time points and the post hoc analysis are shown in Table 3. Note: p < 0.05: statistically significant. Abbreviations: EEC, eccentric exercise contraction; LLLT, low-level laser therapy; MVC, maximum voluntary contraction; ROM, range of motion; UAC, upper arm circumference; CK, creatine kinase; LDH, lactate dehydrogenase; N, Newtons; °, degree; cm, centimeter; IU/L, international units per liter. Note: *p < 0.05: significant difference. Abbreviations: ANOVA, analysis of variance; N, Newtons; °, degree; cm, centimeter; mm, millimeter; IU/L, international units per liter. Figure 1 Change in (A) muscle soreness, (B) MVIC, (C) ROM, and (D) UAC from baseline values that are expressed as pre-exercise and 24, 48, and 72 hours after maximal eccentric contraction. Mean (SD) values of each group are shown. An asterisk indicates a significant difference (p < 0.05) between times shown by the post hoc Bonferroni. A hatch indicates difference between group (p <0.05) shown by independent t-test. Abbreviations: MVIC, maximum voluntary isometric contraction; UAC, upper arm circumference; ROM, range of motion; EEC, eccentric exercise contraction; LLLT, low-level laser therapy. Figure 2 Change in (A) CK and (B) LDH from baseline values that are expressed as pre-exercise and 24, 48, and 72 hours after maximal eccentric contraction. Mean (SD) values of each group are shown. An asterisk indicates a significant difference (p < 0.05) between times shown by the post hoc Bonferroni. Abbreviations: CK, creatine kinase; LDH, lactate dehydrogenase; EEC, eccentric exercise contraction; LLLT, low-level laser therapy. Notes: Data are presented as mean (SD). *p < 0.05: statistically significant difference. Abbreviations: EEC, eccentric exercise contraction; LLLT, low-level laser therapy; MVC, maximal voluntary contraction; ROM, range of motion; UAC, upper arm circumference; SOP, soreness on palpation; CK, creatine kinase activity; LDH, lactate dehydrogenase; N, Newtons; °, degree; cm, centimeter; mm, millimeter; IU/L, international units per liter. A novel approach in the present study was to compare the intervention supremacy of the two established preconditioning interventions (10% EEC vs. LLLT) on markers of muscle damage subsequent to Max-EEC. The results of this study indicated the following: (1) muscle soreness was more attenuated in the LLLT group, whereas no differences were observed in regard to other markers of muscle damage; (2) the preconditioning effects on muscle damage were similar in both the groups at different time points, so both of the interventions may be used interchangeably. It is suggested that a low-intensity eccentric exercise (10%) not only is effective in providing protection against muscle damage after submaximal eccentric contraction exercise (40%),4 but also provides protection against Max-EEC. In addition, another study has also reported that the protective effect of 10% EEC was the same at 2 and 7 days and lasted for 2 weeks.11 With respect to wavelength, it has been suggested that the use of longer wavelengths (808 and 810 nm) allows both better depth of penetration and absorption of photons emitted by the laser. However, the best therapeutic window for avoiding muscle damage is not well known. It has been clearly shown in the current study that both interventions (10% EEC and LLLT) were identical in the recovery of MVC. It has been suggested that performing light-load eccentric exercise (10% EEC) induces faster recovery of MVC after 40% EEC4 and 100% EEC.11 Lavender and Nosaka4 reported that 10% EEC was given 2 days prior to the subsequent damaging exercise for providing protection, which was similar to our study. In addition, low-level laser treatment showed that impairment of muscle function was attenuated up to 2 days after eccentric exercise by application of LLLT immediately before the Max-EEC. They have also reported attenuation in the MVC value of the quadriceps muscle when LLLT was given before the isokinetic contraction exercise.12 Therefore, the present study may relate to this study as the present study also found statistically insignificant differences in changes in MVC between 10% EEC and LLLT after Max-EEC exercise. Felismino et al22 reported that strength performance of both the placebo and LLLT group decreased in a similar pattern following eccentric exercise protocol (placebo 11% and laser group 16%). In the present study, both the groups showed MVC decrements up to 48 hours after Max-EEC. In addition, a reduction of 18% and 17.3% in MVC was seen in 10% EEC and LLLT group, respectively. A previous study by Lavender and Nosaka4 reported a decrease in MVC after 24 hours by 20% as depicted by the graph, and after that, an increase. Felismino et al22 reported a decrease of MVC by 16% in LLLT group. In the present study, it was seen that the MVC was reducing up to 48 hours with a reduction of about 21.3% in the 10% EEC group and 15.02% in the LLLT group, and after 48 hours, the MVC increased by 14.6% in the 10% EEC group and 16.6% in the LLLT group. The mechanism of eccentric contraction exercise causing loss of force may be due to reflex inhibition of the muscle experiencing pain and impairment of excitation–contraction coupling forces.26 Another study indicated that after eccentric exercise, the reduction in force might be due to damage at the tendon attachments or within the series of elastic components of the muscle.27 The exact mechanism of action by which LLLT acts on the reduction of muscle damage remains to be established. Despite this, it is known that the primary damage is caused mainly by mechanical stress.9 In addition, the secondary damage occurs due to metabolic events beginning with the disruption of Ca2+ homeostasis.28 We may speculate that the protective effects of 10% EEC and LLLT might have increased the capability of the muscle to generate force. It has been clearly noted in the current study that both the groups (10% EEC and LLLT) were providing protection in a similar manner. Previous researchers have indicated that 10% EEC induces a smaller decrease in the ROM when compared to control. Lavender and Nosaka4 reported that 10% EEC was found to be effective in inducing faster recovery of the ROM following submaximal eccentric exercise 40% EEC and maximal eccentric exercise 100% EEC.11 Only a single study examined the effect of LLLT on ROM when applied post-DOMS, and no changes were found between the group receiving LLLT and placebo or control groups.29 In the present study, the ROM decreased up to 48 hours in both groups, and reductions of up to 7° in 10% EEC group and 5° in LLLT group from pre-exercise values were found. The mechanism underlying this effect on the ROM is not fully understood; however, pain and muscle stiffness, shortened noncontractile components, changes in calcium homeostasis due to muscle damage, and swelling may influence ROM.26 We can speculate that the protective effects of 10% EEC might have increased the ROM, but the effects of LLLT have not been directly verified in our study since it does not involve direct comparisons with controls. It has been clearly explained in the present study that upper arm circumference in both the groups increased in a similar manner. Previous research by Lavender and Nosaka4 reported that 10% EEC prior to eccentric protocol has no significant effects on changing upper arm circumference. It was also found that 10% EEC of the knee extensors 7 days prior to maximal EEC had a significantly smaller increase11 which was in contrast to our study. The possible reasons for this discrepancy may be that in the current study, the 10% EEC was given 2 days prior to the maximum eccentric exercise protocol. The application of LLLT showed no significant increase when compared to the placebo group.30,31 The mechanism includes swelling either within the affected muscle fibers or in the connective tissue.2 Hassan et al32 reported that swelling is due to the accumulation of bradykinin, histamine, and neutrophils within the injury site. It has been clearly demonstrated in this study that muscle soreness is more attenuated in the LLLT group. On the basis of the results of the present study, we speculate that attenuation in muscle soreness at 48 hours following LLLT is probably related to mainly two aspects: one factor may be explained by subjects’ perception which might have been altered by the application of an external modality which reflects emotional factors in the rating of muscle soreness; another factor may be the anti-inflammatory effect of LLLT which might have caused a reduction in the release of reactive oxygen species and an increase in antioxidant capacity. Previous research has shown that both the 10% EEC and LLLT significantly attenuated the symptoms when compared to both the control and placebo. Lavender and Nosaka4 reported that 10% EEC significantly attenuated the muscle soreness. In addition, the level of soreness was less when compared to their control. Chen et al11 reported that 10% EEC reduced the muscle soreness when it was given 7 days prior to Max-EEC. Douris et al29 discovered that LLLT delivered immediately after a DOMS protocol of the elbow flexors significantly reduced perceived pain at 48 hours postexercise. The mechanism behind the prevention of pain in LLLT is that it has an effect on the central descending inhibitory pathways and the release of endogenous opioids such as serotonin and β-endorphins.30 Bobbert and Vlieger33 reported that after eccentric contraction, resting muscle activation increases, resulting in tonic localized spasm of motor units. Muscle spasm causes muscle pain directly by compressing the blood vessels resulting in ischemia. The increased intramuscular edema, which activates the mechanoreceptor, might be causing pain.34 This could be explained by central sensitization induced by an initial exercise bout and an inherent protective spinal mechanism against the development of soreness. We may speculate that protective effects of 10% EEC and LLLT might have reduced the muscle soreness. It has been clearly demonstrated in this study that both 10% EEC and LLLT have similar effects on CK activity. Lavender and Nosaka4 reported no significant difference in changes in CK activity when compared to control. Another study showed that CK activity is less in 10% EEC group as compared to control,11 and Dos Reis et al35 reported that the application of laser before and after exercise reduced the level of CK. Baroni et al12 found that LLLT provided protection and reduced the level of CK when compared to placebo. Commonly accepted mechanisms of CK release include damage to the muscle tissue, changes in myocyte permeability, and theories of both enzyme deficit and ATP depletion. 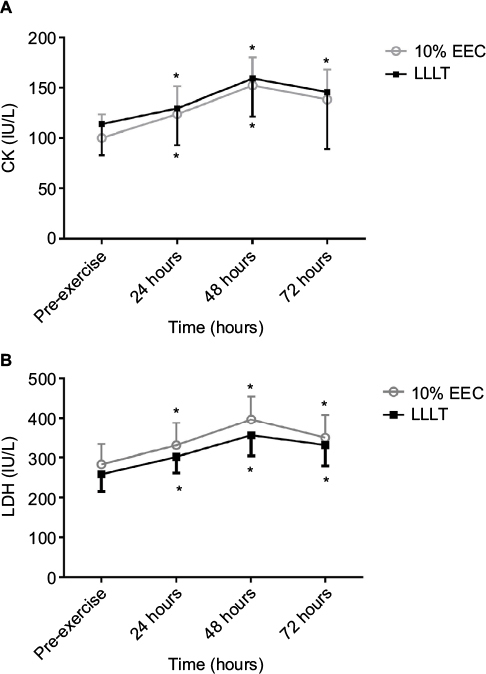 It has been explained in the current study that both 10% EEC and LLLT have similar effects on LDH activity. Previous studies have reported a significant difference in LDH activity as compared to control, placebo,35 and other interventions.36 In accordance with this study, serum LDH activity remained elevated 48 hours after muscle damage. 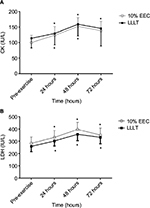 Dos Reis et al35 reported that LLLT application caused a significant decrease in lactate levels when compared to placebo. Baroni et al12 reported that LDH levels increased over time but not in the control group, while Chen et al11 reported that 10% EEC was not damaging to the muscle as shown by the results indicating no change in markers of muscle damage. Some of the study’s limitations are as follows: (1) The findings of the present study could not be generalized because we included only young collegiate men, tested only one group of muscles, and due to both time and ethical constraints, were not able to include a control group. (2) The use of the Lafayette MMT System may not be sensitive enough to detect strength. Light-load eccentric exercise confers similar protective effect against subsequent maximal eccentric exercise as LLLT. Light-load eccentric exercise is convenient to perform and may be used by athletes on field who face challenges of exercise-induced muscle damage everyday during training progression. Moreover, it is speculated that laser helps to reduce inflammation whereas eccentric exercise acts by strengthening the cytoskeleton of the muscles, thereby developing endogenous defense against exercise-induced muscle damage. This investigation will pave the way for future studies to find the appropriate dose of low-level laser for preventing muscle damage by eccentric activity. The authors are grateful to the Deanship of Scientific Research, King Saud University, for funding through Vice Deanship of Scientific Research Chairs. Proske U, Morgan DL. Muscle damage from eccentric exercise: mechanism, mechanical signs, adaptation and clinical applications. J Physiol. 2001;537(Pt 2):333–345. Clarkson PM, Nosaka K, Braun B. Muscle function after exercise induced muscle damage and rapid adaptation. Med Sci Sports Exerc. 1992;24(5):512–520. Warren GL, Lowe DA, Armstrong RB. Measurement tools used in the study of eccentric contraction-induced muscle injury. Sports Med. 1999;27(1):43–59. Lavender AP, Nosaka K. A light load eccentric exercise confers protection against a subsequent bout of more demanding eccentric exercise. J Sci Med Sport. 2008;11(3):291–298. Armstrong RB, Warren GL, Warren JA. Mechanism of exercise induced muscle fibers injury. Sports Med. 1991;12(3):184–127. McHugh MP, Connolly DA, Eston RG, Gleim GW. Exercise-induced muscle damage and potential mechanisms for the repeated bout effect. Sports Med. 1999;27(3):157–170. McHugh MP. Recent advances in the understanding of the repeated bout effect: the protective effect against muscle damage from a single bout of eccentric exercise. Scand J Med Sci Sports. 2003;13(2):88–97. Cheung K, Hume P, Maxwell L. Delayed onset muscle soreness: treatment strategies and performance factors. Sports Med. 2003;33(2):145–164. Howatson G, van Someren KA. The prevention and treatment of exercise-induced muscle damage. Sports Med. 2008;38(6):483–503. Chen TC, Chen HL, Lin MJ, Chen CH, Pearce AJ, Nosaka K. Effect of two maximal isometric contractions on eccentric exercise-induced muscle damage of the elbow flexors. Eur J Appl Physiol. 2013;113(6):1545–1554. Chen HL, Nosaka K, Chen TC. Muscle damage protection by low-intensity eccentric contractions remains for 2 weeks but not 3 weeks. Eur J Appl Physiol. 2012;112(2):555–565. Baroni BM, Leal Junior EC, Geremia JM, Diefenthaeler F, Vaz MA. Effect of light emitting diodes therapy (LEDT) on knee extensor muscle fatigue. Photomed Laser Surg. 2010;28(5):653–658. Liu XG, Zhou YJ, Liu TC, Yuan JQ. Effects of low-level laser irradiation on rat skeletal muscle injury after eccentric exercise. Photomed Laser Surg. 2009;27(6):863–869. Sussai DA, Carvalho Pde T, Dourado DM, Belchior AC, dos Reis FA, Pereira DM. Low-level laser therapy attenuates creatine kinase levels and apoptosis during forced swimming in rats. Lasers Med Sci. 2010;25(1):115–120. Leal Junior EC, Lopes-Martins RB, Rossi RP, et al. Effect of cluster multi-diode light emitting diode therapy (LEDT) on exercise-induced skeletal muscle fatigue and skeletal muscle recovery in humans. Lasers Surg Med. 2009;41(8):572–577. Yamaura M, Yao M, Yaroslavsky I, Cohen R, Smotrich M, Kochevar IE. Low level light effects on inflammatory cytokine production by rheumatoid arthritis synoviocytes. Lasers Surg Med. 2009;41(4):282–290. Rizzi CF, Mauriz JL, Freitas Corrêa DS, et al. Effects of low-level laser therapy (LLLT) on the nuclear factor (NF)-kB signaling pathway in traumatized muscle. Lasers Surg Med. 2006;38(7):704–713. Avni D, Levkovitz S, Maltz L, Oron U. Protection of skeletal muscles from ischemic injury: low-level laser therapy increases antioxidant activity. Photomed Laser Surg. 2005;23(3):273–277. Xu X, Zhao X, Liu TC, Pan H. Low-intensity laser irradiation improves the mitochondrial dysfunction of C2C12 induced by electrical stimulation. Photomed Laser Surg. 2008;26(3):197–202. Felismino AS, Costa EC, Aoki MS, Ferraresi C, de Araújo Moura Lemos TM, de Brito Vieira WH. Effect of low-level laser therapy (808 nm) on markers of muscle damage: a randomized double-blind placebo-controlled trial. Lasers Med Sci. 2013;29(3):933–938. Lau WY, Blazevich AJ, Newton MJ, Wu SS, Nosaka K. Assessment of muscle pain induced by elbow-flexor eccentric exercise. J Athl Train. 2015;50(11):1140–1148. Chen TC, Nosaka K, Tu JH. Change in running economy following downhill running. J Sports Sci. 2007;25(1):55–63. Nosaka K, Clarkson PM. Muscle damage following repeated bouts of high force eccentric exercise. Med Sci Sports Exerc. 1995;27(9):1263–1269. Huang YY, Chen AC, Carroll JD, Hamblin MR. Biphasic dose response in low level light therapy. Dose Response. 2009;7(4):358–383. Mester E, Szende B, Gärtner P. Die Wirkung der Lasstrahlen auf den Haarwuchs der Maus. [The effect of laser beams on the growth of hair in mice]. Radiobiol Radiother (Berl). 1968;9:621–626. German [with English abstract]. Jones C, Allen T, Talbot J, Morgan DL, Proske U. Changes in the mechanical properties of human and amphibian muscle after eccentric exercise. Eur J Appl Physiol Occup Physiol. 1997;76(1):21–31. Hubal MJ, Rubinstein SR, Clarkson PM. Muscle function in men and women during maximal eccentric exercise. J Strength Cond Res. 2008;22(4):1332–1338. Morgan DL, Allen DG. Early events in stretch-induced muscle damage. J Appl Physiol (1985). 1999;87(6):2007–2015. Douris P, Southard V, Ferrigi R, et al. Effect of phototherapy on delayed onset muscle soreness. Photomed Laser Surg. 2006;24(3):377–382. Ferreira DM, Zângaro RA, Villaverde AB, et al. Analgesic effect of He-Ne (632.8 nm) low-level laser therapy on acute inflammatory pain. Photomed Laser Surg. 2005;23(2):177–181. Leal Junior EC, Lopes-Martins RA, Dalan F, et al. Effect of 655-nm low-level laser therapy on exercise-induced skeletal muscle fatigue in humans. Photomed Laser Surg. 2008;26(5):419–424. Hassan AH, Ableitner A, Stein C, Herz A. Inflammation of the rat paw enhances axonal transport of opioid receptors in the sciatic nerve and increases their density in the inflamed tissue. Neuroscience. 1993;55(1):185–195. Bobbert PA, Vlieger, J. Light scattering by a sphere on a substrate. Physica A. 1986;137(1–2):209–242. Stauber WT. Delayed onset muscle soreness and pain. In: Zachazewski JE, Magee DJ, Quillen WS, editors. Athletic Injuries and Rehabilitation. 1st ed. Philadelphia: Saunders; 1996:92–98. Dos Reis FA, da Silva BA, Laraia EM, et al. Effects of pre- or post-exercise low-level laser therapy (830 nm) on skeletal muscle fatigue and biochemical markers of recovery in humans: double-blind placebo-controlled trial. Photomed Laser Surg. 2014;32(2):106–112. Kim MK, Cha HG, Ji SG. The initial effects of an upper extremity neural mobilization technique on muscle fatigue and pressure pain threshold of healthy adults: a randomized control trial. J Phys Ther Sci. 2016;28(3):743–746.